These days, when I watch a good working dog hone in on scent — whether it’s a dog locating the scent of human remains or trailing someone who is still alive — I can see him trace its passage in the air until he’s drawn a clear picture with his nose. An experienced dog can distinguish the difference between scent that has lifted in the heat of the day, settled down in the ridges of rough grass, or been pulled hard toward the rushing water of a creek. I work scent also, though I don’t run as fast or as hard. I can recog­nize urine in the muggy concrete stairwell of a parking garage, mildew liberated from under sheaves of rotted leaves, or the fishy musk of my German shepherd after a swim in the local river in August. I knew, even before I started researching dogs’ noses in a sustained manner, that they were much better than humans’. My cadaver dog, Solo, has a much better nose than mine, and not just for locating human remains. My food-loving husband, David, can use a pair of scissors on a package of vacuum-sealed hanger steak in the kitchen, and the silent exhalation of bloody air will awaken Solo and bring him running from another area of the house. Solo with author Cat Warren. Credit: Cat Warren. Link: CatWarren.com. Conversely, it seemed lazy to concede that dogs are the masters of the domain of olfaction before I’d done any scientific fact-checking. Sure, Solo has a bigger, and probably better nose than I do, but size isn’t everything. So what’s the truth about dogs’ sense of smell? The truth is, we don’t know that much about it. 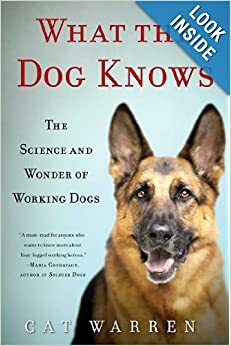 As I began researching the dog’s nose in the wake of training Solo to be a cadaver dog, I noticed wildly fluctuating figures in both the sentimental and scientific literature:the dog’s nose was either ten times or a hundred times or a thousand times or tens of thousands of times better than the human nose. Those figures raised doubts. In tracking rumors, as with tracking most things, it’s good to start at their genesis. A growing body of scientific evidence suggest­s that not only have the nose and its receptors been important to the survival of creatures for at least hundreds of millions of years, they may also have been a key evolutionary force driving the growing intel­ligence of mammals. In 2011, Texas paleontologists published their analysis of the skulls of pre-mammals living 190 million years ago. The Hadrocodium wui — a shrew­ish beast with a skull smaller than a paper clip — didn’t have the option of rejecting smells. It tremulously ventured forth to sniff for grubs and insects, probably at night so the diurnal dinosaurs didn’t accidentally squash it. Its fur was important, its twitchy ears important, its vision important. But, the paleontologists argued in Science(1), it was the critter’s olfaction system that was the most impressive thing in that bitty skull: the olfactory system, the paleontologists argued, played a major role in helping the mammalian brain evolve, apparently to the point that we humans — the most advanced of mammals — could turn our collective nose up at thinking too much about smells. Yet there’s still much about this particular sense that scientists don’t know. As for comparing one species’ nose with another? There’s little research on that. People who train dogs that sniff for a living, however, have long realized that scientists working in laboratories with untrained dogs have underestimated the capacity of a good dog’s nose. And even without dozens of studies, there’s general agreement that some species’ noses do rise above the rest, literally and figuratively. I bet if we could train bears to track, their noses would confer real brag­ging rights. Biologists believe that grizzly bears have a much better sense of smell than the dog. Bears’ noses get less press and less scientific study than dogs’ for all the obvious reasons. If you ever get the chance to stare at a grizzly’s nose close up, you can see what a stunning instrument it is—tilted up at the end,with huge flaring nostrils. If you are at exactly the right angle, you can see through that nostril space to the blue sky beyond. The grizzly bear can manipulate her nose like a flautist can flex her fin­gers. If you could peer inside her horribilis skull at the nasal cavity, you would see delicate structures that look like two huge morel mushrooms or rounded honeycombs planted side by side. Their job is to process scent. How well? Pretty darn well. For miles, it’s estimated. That’s a difference of a factor of ten. Less than some of the variations I’ve seen used with dogs, but hardly a rounding error. Research is starting to blossom in this world of human olfaction, and it’s taking some interesting turns — ones that working-dog trainers and handlers can relate to. Certain scents turn humans into the kinds of trackers whose accomplishments seem to rival those of trained scent dogs. Scientists took a group of Berkeley un­dergraduates, showed them a video of canine scent-tracking, and then took them out on a lawn that had been laced with essential oil of choc­olate. Scientists gave the students blindfolds, thick gloves, knee and elbow pads, and let them loose, off-lead. Could they track the choco­late using their noses, crawling on their hands and knees? Absolutely. The track they followed looked like the zigzag of a dog’s trail. The Berkeley scientists loved the students. Unlike rats or dogs, they could be debriefed afterward: “Hu­mans are an appealing animal model for addressing such questions be­cause they can follow task instructions and accurately report behavioral strategies,” noted the article in Nature Neuroscience(2). And during a repeat chocolate-tracking trial in Berke­ley? Students cut their tracking time by nearly two-thirds. They learned to sniff faster — just like good working dogs. Excerpted from What the Dog Knows: The Science and Wonder of Working Dogs, out now in fine retailers everywhere.